The Apple Watch launch date has finally arrived, and many early adopters are taking the time to familiarize themselves with its functions and features. Where most of us tend to treat brand-new gadgets like newborn babies, a certain faction of the YouTube community will no doubt be hellbent on destroying the wearable, and as we wait for the usual entertainers to boil, burn and perhaps even shoot at the Apple Watch, one channel has posted a test clip of some educational value. The Apple Watch is water-resistant enough to be used in the shower, or out for a jog in the rain, but is it truly waterproof? Can you swim with it? Find out below! Apple’s marketing team has been very wise with its choice of words when describing Apple Watch’s tolerance to water. Tim Cook indicated back in February that he wears his device all day long – including in the shower – but the word ‘waterproof’ has never been explicitly stated. With a fair amount of lingering ambiguity, the guys at FoneFox got their hands on the device earlier than most since Australia is ahead of the remaining launch nations in terms of time, and wanted to properly test Apple Watch’s water-resisting credentials. Starting off with a simple splash, the Apple Watch Sport used as the guinea pig passed with flying colors, and when put into a shower situation and subsequently submerged in water for five minutes, the device continued to function with no issues or problems. To take things up a notch, the device was then taken into a swimming pool, and while, under deepish water, the touch-screen wouldn’t function, there was no lasting damage as it worked just fine once brought to the surface. This clip proves that the Apple Watch is a tough cookie, although it does not necessarily mean it’s waterproof, and we’d obviously discourage anybody from replicating this test. Since Tim Cook uses his in the shower, you should have no problems there, but if you are, say, a regular swimmer, you’d probably be better off leaving the Apple Watch in your locker. Have a look at the embedded video below, and do leave your thoughts and comments via the usual channels. 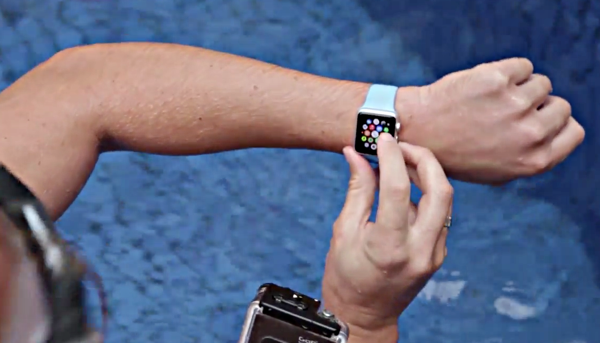 It is important to note that Apple officially states Apple Watch as splash and water resistant, not waterproof. where is the test how ugly this retarded iDeadBattery is? Thanks for this video. Hate to see you hammer a perfectly good watch, but it’s great to know that it is water resistant in most normal cases.